Now that's a mouth-full! And it should be! I am so thrilled that this recipe-creation of gluten/dairy-free peanut-butter cookies turned out to be so incredible! 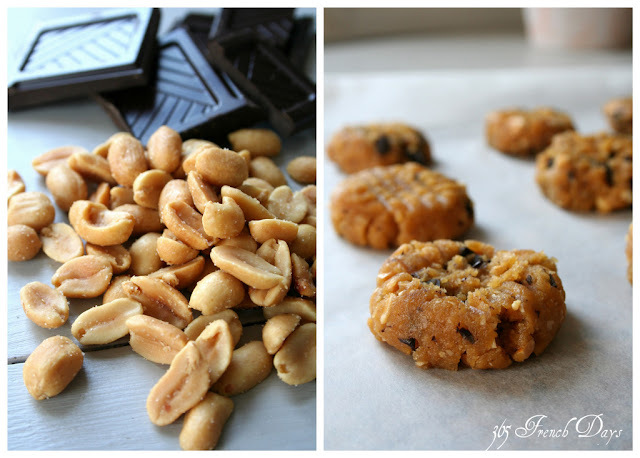 My two favorite food-groups -- nuts and chocolate! 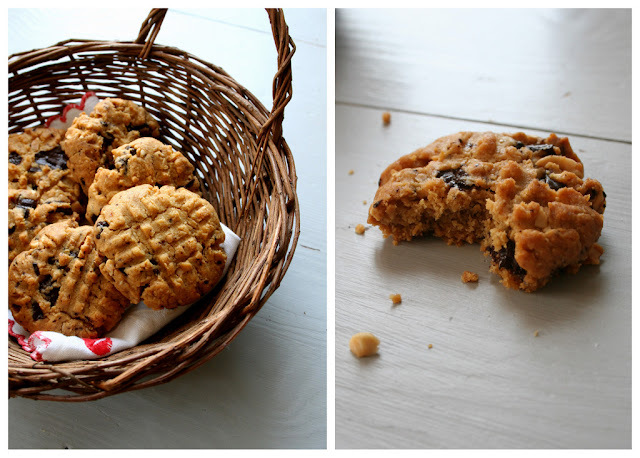 I was originally working up this recipe to make cookies for the kids -- but I think they turned out to be quite decadent in a grown-up sorta way too! I made a batch yesterday for 'goûter' which is the snack that French children have when they get home from school (it usually consists of something chocolate!) to eat while doing their 'devoirs' (homework). 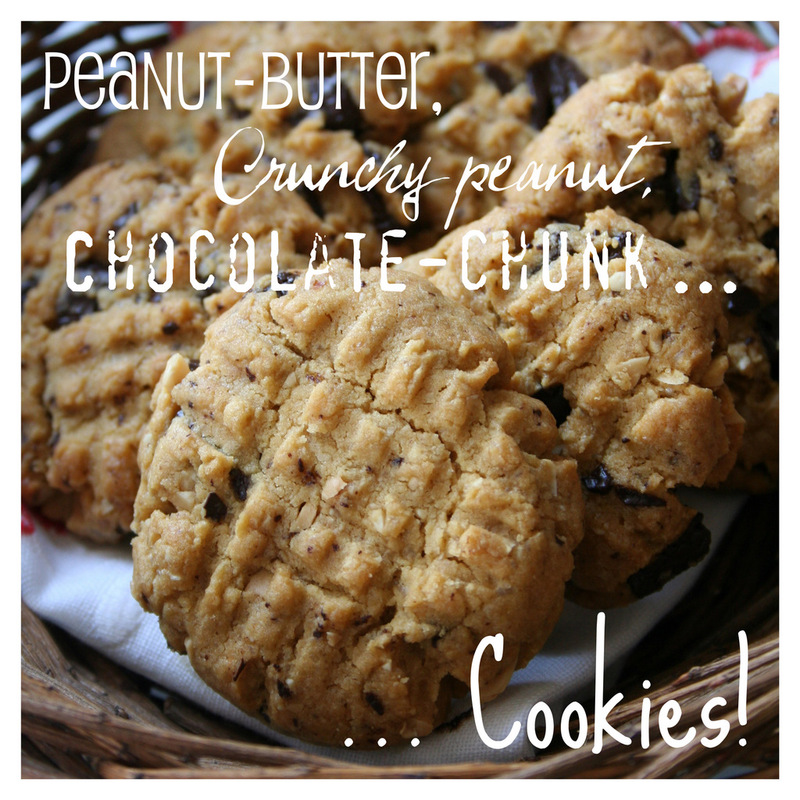 This afternoon I made a second batch, adding the chocolate chunks and chopped peanuts. My oldest son is home early from school (there was no Latin today, as his teacher is away skiing.....I did mention this is France right? 'Vacances' is a priority!) So he and I will share the half dozen that are just about to come out of the oven. As much as you want -- chopped dark chocolate chunks -- go ahead--live a little! Beat the butter with the sugar, peanut butter and egg until creamy-- about 2 minutes. Mix together the dry ingredients - flour, baking soda, baking powder and salt. Stir the dry ingredients into the sugar butter mixture and add chopped nuts and chocolate chunks. It helps to chill the cookie batter for about 30 minutes before you roll into small balls. Press down with a fork. Bake on parchment paper for 15 minutes or until golden. Big glass of milk, icy glass of tea or coffee..... have one..... or six.